After reminding His disciples not to leave Jerusalem until the coming of the Holy Spirit, Whom He promised to send, our Lord “raised His hands and blessed them. As He blessed them, He parted from them and was taken up to heaven” (Lk. 24:50-51). In the Acts of the Apostles we read that the disciples were looking on as Jesus Christ was lifted up but then, “a cloud took Him from their sight” (Acts 1 :9). Thus the promise Jesus gave to the Jews, that they “shall see the Son of Man ascend to where He was before” (Jn. 6:62), was literally fulfilled. Our Lord indeed was “taken up in glory” (1 Tim. 3:16). The testimony of Christ’s glorious ascension into heaven is not only found in the Scriptures but is also supported by history. According to the testimony of Eusebius of Caesarea (d. 339), Helen, the mother of the Emperor Constantine, “raised a stately structure on the Mount of Olives in memory of the Ascension to heaven of Him, Who is the Savior of mankind, by erecting a sacred temple on the very summit of the mountain” (Eusebius, Life of Constantine, Bk. 3, Ch. 43). Unfortunately this memorial basilica on the Mount of Olives was destroyed by the Persians in 614. It was again rebuilt in the eight century only to be destroyed once again by the infidels. In the twelfth century the Crusaders undertook the task of rebuilding the basilica, but before they were able to finish the construction it was once more destroyed by the Saracens, never to be rebuilt again. The only thing that remains to the present time is a small octagonal chapel, covering the exact spot from which, according to tradition, our Lord actually ascended into heaven. Then we have testimony of Cyril of Jerusalem (d. 386), who in his catechetical instructions quotes in witness of our Lord’s Ascension, saying: “From heaven He descended to the earth in Bethlehem, but to heaven He ascended from the Mount of Olives. The Mount of Olives stands to this day, displaying to the eyes of the faithful Him, Who ascended on the cloud. This is the heavenly gate of His ascension” (Catechetical Lectures 14, 23). Then again he refers to the Mount of Olives as to that “holy mountain from which Christ ascended to His Father” (Ibid., 10, 19). The observance of the Ascension feast is of great antiquity. Augustine (d. 430) does not hesitate to admit that the feast is of apostolic origin. (Epistle to Januarius, 118). But in truth we do not have any historical evidence of its celebration as a separate feast until the end of the fourth century. Shortly thereafter the Holy Ascension was observed by the entire Church as a solemn feast in the East as well as in the West. The Easter season originally lasted fifty days and ended on Pentecost Sunday. 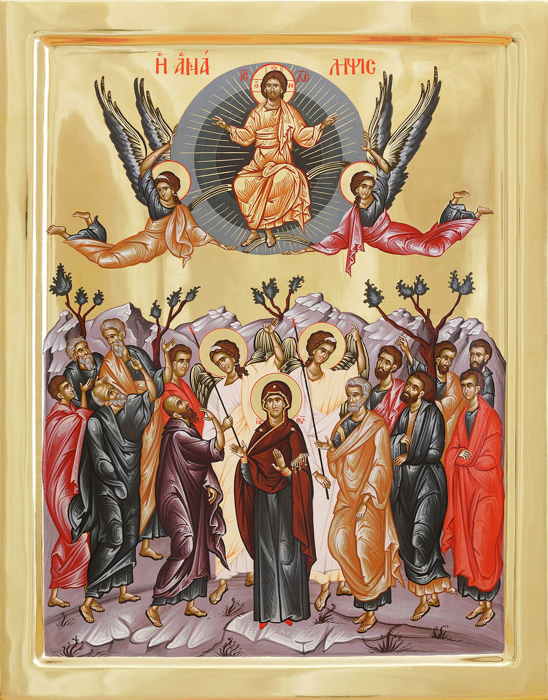 Since the Scriptures associate the descent of the Holy Spirit with the glorious Ascension of our Lord into heaven, up to the middle of the fourth century the mystery of the ascension was commemorated on Pentecost. This is the reason why Church historian, Eusebius of Ceasarea (d. 339), testifies that the holy and glorious solemnity of Easter ended after “a period of seven weeks and is being sealed with the great festival of Pentecost on which, according to the Holy Scriptures, the Ascension of our Savior into heaven and the descent of the Holy Spirit among men had taken place” (Life of Constantine, 4, 64). 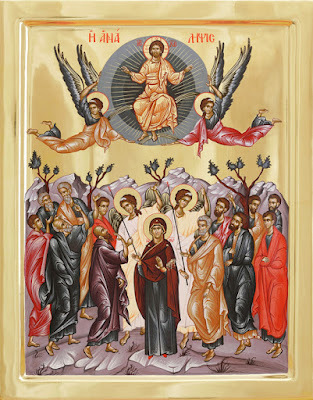 At the end of the fourth century the Ascension began to be celebrated as a distinct festival, separately from Pentecost. It was then that the Easter season was abbreviated to forty days as indicated in the Acts of the Apostles. According to the Acts, Jesus, after His glorious resurrection, continued to appear to His disciples “for forty days, speaking to them about the kingdom of God” (Acts 1:3). On that occasion some ”passages of the Scriptures were read, hymns, interpersed by prayers, were chanted, and the proper antiphons were also intoned” (Egeria, Diary of a Pilgrimage, ch. 43). But in Bethlehem, according to the testimony of the same Egeria, they already celebrated the Holy Ascension on the fortieth day after Easter, that is on the Thursday of the sixth week (Ibid., ch . 42). There the feast of the Ascension was celebrated with solemn festivity, being preceded by a vigil. Thus, at the end of the fourth century, the Ascension already started to be celebrated separately and, eventually, it became one of the most solemn feasts of the liturgical calendar with its own vigil and post-period of eight days (apodosis or leave-taking). “Count forty days from the first Day of the Lord (meaning Easter) until the fifth day (Thursday) of the sixth week, and celebrate the Feast of the Ascension of the Lord, since on that day He completed all the dispensation and all His work of salvation, and returned to God the Father Who sent Him, and is seated at the right hand of the Father” (Bk. 5, Ch. 19). The celebration of the Ascension was always connected with a procession. Thus in Jerusalem, as testified by the pilgrim Egeria, the faithful walked in procession to the top of the Mount of Olives. In Antioch, Syria the people went in procession to the suburban church in Romanesia, where John Chrysostom delivered his famous sermon, On the Ascension of our Lord. In Constantinople the faithful, according to the testimony of the Church historian Socrates Scholasticus (d. c. 439), used to come together and celebrate the feast in the church of Elaea, just across the harbor of the city (Socrates, Eccles. History 7, 26). These processions just enhanced the solemnity of the celebration of the feast. "You were born, our God, in a manner of Your own choosing. You appeared and suffered in the flesh as You willed. Through Your resurrection You conquered death and ascended into glory, fulfilling all things; You sent down the divine Spirit upon us, therefore in songs we praise Your divinity." The author of the apolytikion for the feast is unknown, but the kontakion is generally ascribed to the renowned hymnwriter of the sixth century, Romanos the Melodist. There are two Canons for the celebration of Matins. The first was composed by John of Damascus (d. 749), the famous hymnographer of Saint Savvas Monastery near Jerusalem. The other is ascribed to the monk of the renowned Studion Monastery in Constantinople, Joseph the Studite (d. 832), who was persecuted for the veneration of holy icons. The liturgical hymns for the feast of the Ascension were inspired by Sacred Scripture and by sermons of the prominent Fathers of the Church. They describe in detail not only the Ascension and glorification of our Lord with His human nature in heaven, but also our own glorification together with Jesus. By His glorious ascension our Lord Jesus Christ completed the work of our redemption and reopened the gates of heaven to the whole human race, as attested by John Chrysostom: “And now we, who before were considered unfit to dwell even upon the earth, are being raised up to heaven, ascending with Christ to the heavenly kingdom” (Homily on the Ascension, 1).